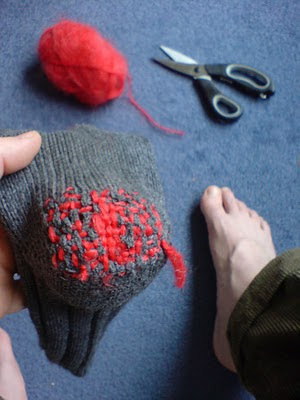 Seekst thou a yarn for to fix your sorry, ravelled socks? Old Hubert says forgeteth not the ball of wool that thou - with a mind for to bind red tails for pike and perch lures - did purchase at a car boot sale yonks hence. For verily, sayeth Hubert, verily it doth work right well: one's clothèd heels full snugly praise y'r industry when wrapped therein. I've always said you're a great story teller, but that's some yarn! A good looking repair job there Hubert, well done.